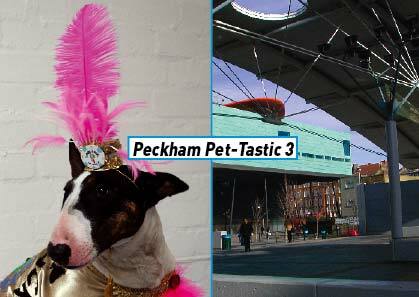 Once again, Rachael House invites you to make a costume, dress up your dog, and bring it along to Peckham Pet-Tastic 3, the canine art social event of the year. During 2006 Rachael House’s Peckham Pet-Tastic was enticed far away. In May, dogs dressed up and congregated at Hå gamle prestegard in Norway. In August, Bexhill Bow-Wow transformed the De La Warr Pavilion into a gaudy throbbing mass of dogs and humans. In 2007 we even went to neighbouring Lewisham. Now Peckham Pet-Tastic is back where we belong, in Peckham Square, our spiritual home. Bigger, bolder and even more extravagantly beautiful. We are excited to be joined this year by artists Marcia Farquhar, WebsterGotts, Daniel Lehan, Simon Ould and Laura Wilson. While you exchange tales of stepping in it with Marcia, duo WebsterGotts will desperately be attempting to befriend your dog. You won’t believe your eyes as Simon transforms himself into a canine war hero. Daniel will be headlining dogs in the news as Laura feeds you popcorn and reminisces about dogs of the silver screen. You may also dress a dog-shaped biscuit with icing, decorate a dog mask and become part of the pack, have your face painted to more closely resemble a dog and pose for photos with a Pound Puppy. As if that’s not enough, there is also a display of dog masks embellished by artists Edwina Ashton, Marc Baines, Gayle Chong Kwan, Susan Collis, Craig Conlan, Jo David, Sarah Doyle, Amanda Francis, Sam Jones, Lady Lucy, Rebecca Nassauer, Stephen Nelson, Woodrow Phoenix, Hester Reeve, Rosemary Shirley, Andrea Stokes, Shane Waltener and Annie Whiles. The face of PPT3 is Onion the miniature bull terrier, artist’s muse and star of film and video. Rachael has made Onion a glamorous Lady Luck costume for PPT3, make sure you pay Onion your respects, and good fortune will certainly follow you. Peckham Pet-Tastic 3, once more with feeling. As well as making PPT3 happen, in June 2007 Rachael House is part of Second Life at Portman Gallery, London E2 0PX, she will also be celebrating Johnny Trunley, The Peckham Fat Boy at Destination Area 10, London SE15, and her comic strips shown in an exhibition of queerzine art in Milwaukee, Wisconsin US, organised by the Queerzine Archive Project. Rachael House would like to thank- Jo David, Alice Anderson, Justine Pearsall, Sarah, Aron and Onion, Southwark Events Team Paul, John and Anila and all the dogs. Peckham Pet-Tastic 3 is dedicated to the memory of Deen David, her support helped to make it all possible. & Grunts for The Arts.